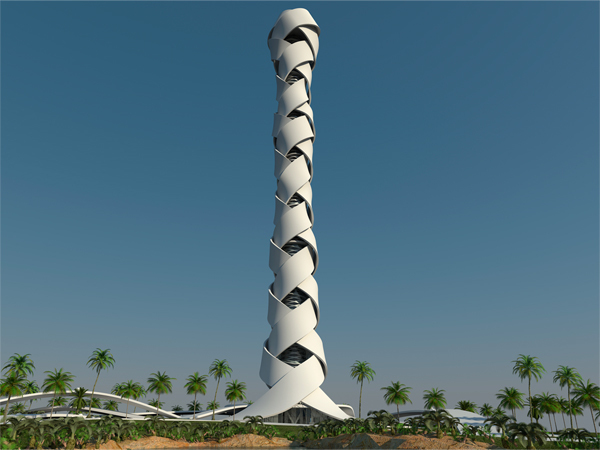 In an attempt to bring out the various aspects of Arab culture in the form of a concrete structure, architects Giuseppe Farris and Stefan Schoning joined hands and have proposed the Woven Tower, which comes draped in sheer uniqueness. The facade looks as if it has been interwoven, with spiral forms running all through the design, creating an aesthetically appealing structure. The twirling design of the structure clearly corresponds to the commerce and trade routes that have been a part of Dubai through history. The outside design of the building has fetched heavy inspiration from the date palm, which an essential part of the everyday life of Dubai. Date palm is not only traded, but the material is exploited in fishing boats, local frond houses as well as in the impressive palm weaving craft. The outer skin of the Woven Tower is also a celebration of tribal legacy that existed in Dubai. The inside is a clear picture of tribal foundation that gives Dubai its unique identity. The design intends to let people know about the values and their importance in the present century. The building can be accessed via different routes. Every time someone takes a particular route, they will be greeted by the tribal culture and history of Dubai, which has been beautiful spread all across the design. An open structure at the ground level is a clear indication of the warm hospitality and inviting nature of the people of Dubai. Different levels have a different story to tell, which will leave people rich with history and intoxicated by the Woven Tower’s beauty.